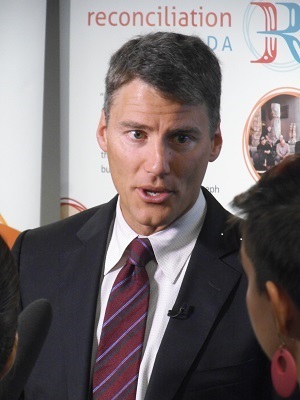 “I ask the Creator to come down and bless this event.” That was the prayer of Theresa Campbell from Musqueam Nation as she opened a news conference hosted by Mayor Gregor Robertson at Vancouver City Hall July 25. The event was organized to announce the Truth and Reconciliation Commission of Canada (TRC) and Reconciliation Canada week of activities from September 16 – 22. Referring to the Walk for Reconciliation which will close the week, he said that while organizers have been hoping for 50,000 participants, he believes Vancouverites have received the initiative so warmly that 100,000 could turn up on the day. 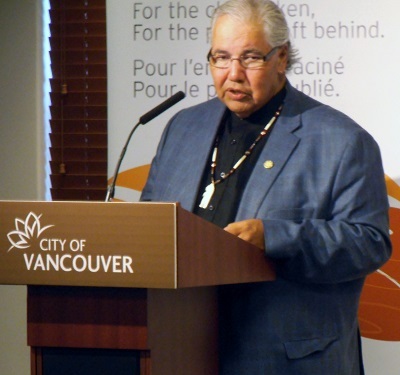 In announcing the BC National Event (September 18 – 21), TRC chair Justice Murray Sinclair said reconciliation between Aboriginal and non-Aboriginal Canadians depends on a shared understanding of the history and legacy of Indian Residential Schools. “Imagine what it would be like,” he said, ” if the government were to come to you tomorrow and tell you they were going to take away your children or grandchildren . . .
“For about 120 years, Aboriginal children in British Columbia were sent to residential schools funded by the federal government and run by the churches in order to be stripped of their languages, cultural identity, spirituality and traditions,” he said. The TRC is an independent commission established as a result of the 2007 Indian Residential Schools Settlement Agreement. Its mandate is to inform all Canadians about what happened in the 150-year history of the residential schools in Canada, and to guide and inspire a process of reconciliation and renewed relationships based on mutual understanding and respect. Probably the most important aspect of the BC National Event will be the opportunity for survivors of the schools, their children, and others whose lives have been affected by the residential schools to talk about their experiences, either publicly or in private sessions. It will also feature traditional ceremonies, survivor gatherings, an education day for students (UBC is suspending all classes that day), cultural performances, films and gestures of reconciliation. Reconciliation Canada will host activities before and after the TRC event, most notably an All Nations Canoe Gathering September 17 and the Walk for Reconciliation September 22. Other speakers echoed that sentiment, several times referring to the fact that Vancouver has proclaimed June 21, 2013 to June 20, 2014 as the Year of Reconciliation. 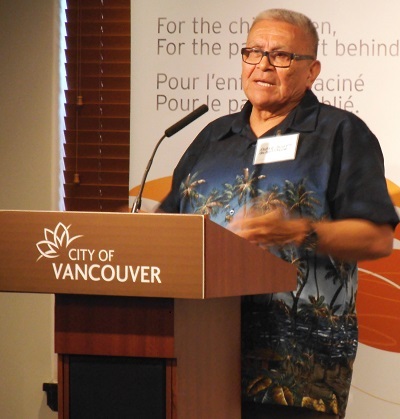 Robertson urged other cities across Canada to follow Vancouver’s lead, saying: “Reconciliation Week will be a historic opportunity to heal from the past and build a shared future based on empathy, understanding and respect. We are proud to be the first city in Canada to proclaim this the Year of Reconciliation and honoured to be hosting the BC National Event. 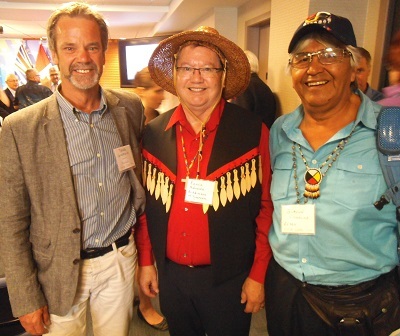 Doug Goodwin (left) and Rennie Nahanee were among the church leaders iin attendance, along with Gordon Chualna. A number of Christian leaders attended the event, including Doug Goodwin, executive secretary of the BC Conference of the United Church, Hans Kouwenberg, director of Presbyterian Formation with the Vancouver School of Theology, Rennie Nahanee, coordinator of First Nations Ministry for the Roman Catholic Diocese of Vancouver and Denece Billesberger of the Sisters of the Child Jesus. They are all part of an Ecumenical Advocates group which has representatives from the four denominations which ran residential schools (Catholic, Anglican, United, Presbyterian), as well as from several evangelical groups including Mennonites, Alliance, Pentecostals and Baptists. These Ecumenical Advocates have met for several years to support the TRC process and played a significant role in the establishment of Reconciliation Canada. The role of the church in the residential schools, and since, received very little comment at the news conference, though Murray Sinclair did thank the four major participating denominations for their support of the TRC process. The lighting of the Flame of Reconciliation, September 16: A sacred fire will be lit at Ambleside to symbolize the start of Reconciliation Week. The All Nations Canoe Gathering, September 17: Canoes will be paddled into False Creek from Kits Point to Science World, to be welcomed in a traditional ceremony to the Coast Salish lands. The TRC’s British Columbia National Event, September 18 – 21: The TRC’s sixth National Event takes place at the PNE. All are welcome to bear witness to the experiences of survivors of Indian Residential Schools, and the schools’ continuing legacy. No registration is required and all activities are free. The Walk for Reconciliation, September 22: People from Canada’s many cultures will walk a path together in a shared commitment to reconciliation. A New Way Forward Celebration, September 22: Reconciliation Week culminates with a celebration marking a new beginning and a show of commitment to continuing on the journey of reconciliation, featuring multicultural performers and various festivities.